Enjoy the laid-back Balinese lifestyle just two and half hours from Sydney, re-energise with a well-deserved break away. Bali at the Bay has been architecturally designed as two, two bedroom fully self-contained luxury apartments. Sweeping timber verandas with carved lotus tipped poles. Double spa bathrooms have lush foliage and illuminated statues. Trickling water features, fresh flowers, incense and candles set the mood for Romantic time alone. Upstairs the light filled Nirwana Heavenly Apartment has four verandas, filtered ocean views and floor to ceiling glass doors that open to let in gentle sea breezes. 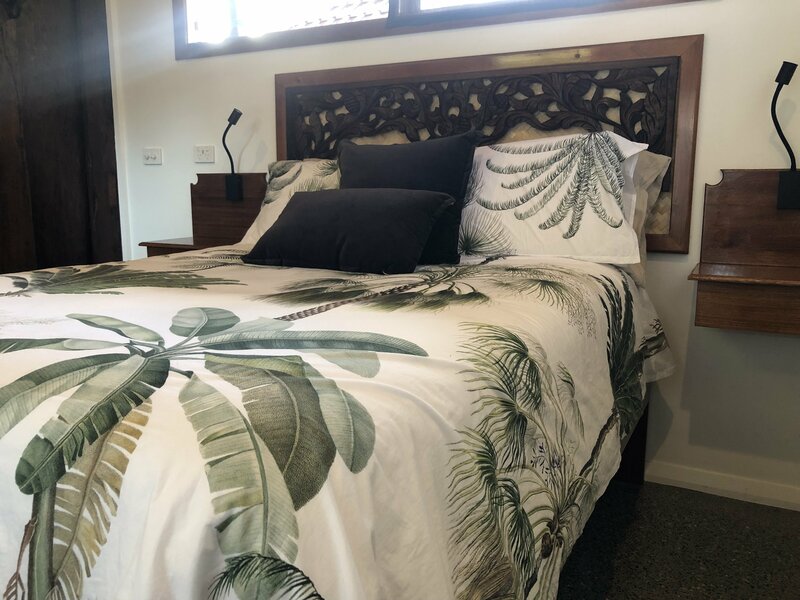 Downstairs, the Shinto Garden Apartment has polished concrete floors inlaid with paua shell, stone feature walls, large bamboo lounges, hammock and wood barbecue. Nirwana - Heavenly Apartment - upstairs Two x 2 Bedroom Balinese Inspired fully Self Contained Luxury Apartments. Spa rooms have their own Garden Bays with Statues lit up at night, Flowers, Candlelight & Incense simply enhance the Romance & Mystery. A 2 min walk alongside the Bush Reserve opposite willl place you at the waters edge on beautiful Shoal Bay Beach. Many features and extras including Bose Music System with Ipod and Dock, DVD & CD Selection, Modern Kitchen with Dishwasher, Fresh Linen, Batik Bathrobes, Towels, Complimentary First Breakfast, Quality Champagne & Beer, Fruit , Dip,Cheese and Biscuit platter plus many extras which enhance the Ambience and Attention to Detail. Shinto Garden Apartment Two x 2 Bedroom Balinese Inspired fully Self Contained Luxury Apartments. Features polished concrete floor with internal stone walls and lead light doors and window. This apartment also has a wood fired BBQ and Hammock. Spa rooms have their own Garden Bays with Statues lit up at night, Flowers, Candlelight & Incense simply enhance the Romance & Mystery. A 2 min walk alongside the Bush Reserve opposite willl place you at the waters edge on beautiful Shoal Bay Beach. Many features and extras including Bose Music System with Ipod and Dock, DVD & CD Selection, Modern Kitchen with Dishwasher, Fresh Linen, Batik Bathrobes, Towels, Complimentary First Breakfast, Quality Champagne & Beer, Fruit , Dip,Cheese and Biscuit platter plus many extras which enhance the Ambience and Attention to Detail.